We are an independent family business, engaged in the supply of Industrial Solvents. Our emphasis is on fostering long-term relationships with our stakeholders. Having been established since 1969, we place great importance upon developing and maintaining strong personal links with our customers, suppliers and employees. We are pleased to say that for many in each of these groups we can measure our history in terms of decades. The Company was started by David Hammond in 1969, when he expanded from making his own paint thinners, and began supplying solvents to other end user industries. From this many new solvents were added and toll manufacture of blends for others became a key part of the business. David passed the reigns on to his two sons some twenty years later, and we are pleased to say that the third generation of the Hammond family is now working in the business. 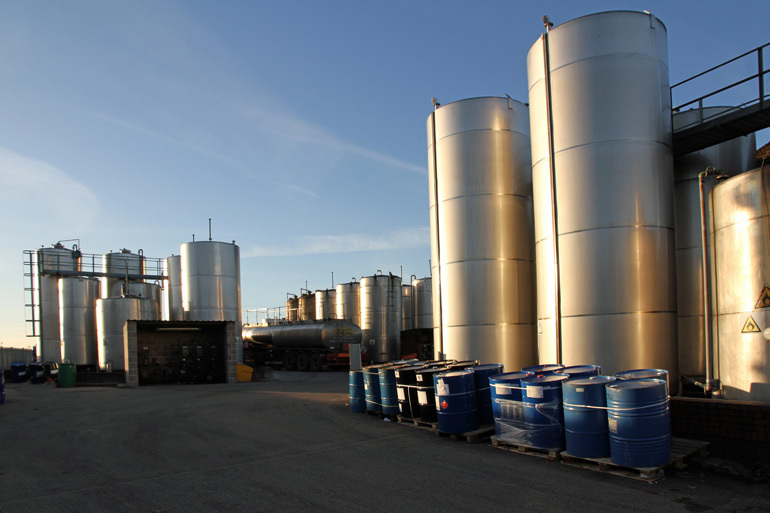 Our activities cover an operational solvent storage, blending, packing and distribution site. We own, manage and staff these activities with our permanent direct employees. This allows us to deliver flexible solvent supply for the modern business world, by using our assets responsibly, efficiently and consistently. Our purpose built fleet vehicles are driven by experienced ADR trained drivers. Vehicles are all equipped with tail-lifts and drum trolleys – helping you take delivery direct to your store in many cases. For 205 litre drums and Intermediate Bulk Containers (IBC’s), these packages are mostly supplied on a fully returnable basis. We are highly active in supplying blended solvents to many diverse sectors of UK industry. Solvents and blends are supplied in a range of UN approved packages from a 1 litre can all of the way up to 1000 litre IBC’s, with flexible order and blend batch sizes. We can offer own-label packaging formats and confidential direct delivery agreements for your own re-sale markets, using your own documentation. We do not have high batch-set-up costs, so we can offer blends in small batch sizes, even down to a single container. Our wide solvent range allows us to be highly versatile and responsive to your requests. We’ll try to keep it simple to reduce the costs of supply, but if you need a bit of a difference we can provide advice and pricing options. Our solvents are nearly all held in bulk storage so custom blending is cost effective and prompt. It’s not just solvents we can blend - please enquire using the contact form if your products are hybrids liquids. If we cannot help, we may be able to refer you on to others who can. Quality is assured using our well established but constantly evolving systems. Solvent is stored in product dedicated stainless steel bulk tanks, with their own direct inlet and outlet lines and dispensing meters to allow us to be flexible on batch sizes. We are long-term members of Chemical Business Association, which is the leading trade association in this sector. This, together with our membership of Freight Transport Association, enables us to keep informed of the evolving regulatory world to support our aims.